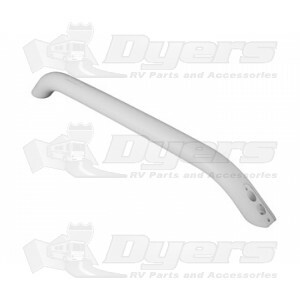 BIG Grab Handle - Plastic - White 18"
The center to center inside attachment hole spacing is 14 1/2" and the two outside attachment hole spacing is 16 1/4". I was not able to fixe it to the door framr of the RV. I would recommend that before buying this product that you check that the place would intent to mount the handle has a solid backing. Excellent product, I bought it for my wife had difficulties to board our RV. Now she grab onto this handle and enter the RV with difficulty.